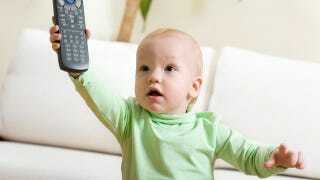 In case you missed the memo about Baby Einstein DVDs not giving your infant the ability to comprehend theoretical physics, scientists have released more research proving "baby media" is fairly useless. Rebekah A. Richert, an assistant professor of psychology at the University of California, Riverside, tells USA Today, "I don't think we've seen anything to suggest that kids younger than 18 months, even with parents' support, will learn anything from a DVD." After studying 96 1 and 2 year olds, she found there's no relationship between the children's exposure to educational DVDs and their general language development. And those who started watching the DVDs young actually scored lower on language skills tests. Another study at the University of Virginia revealed shocking evidence that parents talking to kids during daily activities, not parking them in front of a TV, is the key to boosting the tots' language skills. The problem is babies need parents to explain that Elmo's crayons are they same as the crayons in their hand. According to Dr. Richert, "They don't really understand the relationship between what's happening on screen and the real world around them." And you can't really blame them. We're still not sure why that baby lived in the sun on Teletubbies.